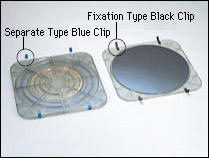 Special wafer shipping systems are also available at Daitron. The ND Series was developed for wafers with dicing rings. The ND Series system is cost efficient as it also utilizes the coin stack carrier configuration. The Single Wafer Package System (SWPS) is a perfect solution for wafers that cannot be stacked. For the SWPS carrier the only size available is for 12 inch diameter wafers. The Bumped Wafer Package System (BWPS) is designed for constructed wafers, whose top surfaces are sensitive and cannot come in contact with anything during handling and shipping. For the BWPS carriers non contact trays are used instead of separators. Shipping systems are also available for GaAs wafers in 4 and 6 inch diameter sizes.